You read that right -- Yoga with Goats. Yoga with Goats classes started popping up at the end of 2016 and are one of the newest yoga crazes. We previously attended a Yoga with Cats event with adoptable cats (that's how we met and adopted our first cat, Cappuccino), but even if the goats were adoptable, Dave probably would not have let me bring one home. Last month when I read about a Yoga with Goats class starting in Amherst, I knew that I needed to schedule myself in a class, no matter how inconvenient the drive might be for me. Usually Dave alone embarks on weird journeys with me, but this time my former intern, the goat loving 4H alumna Julia, joined us. She educated us on goats and goat etiquette on the drive to Amherst. 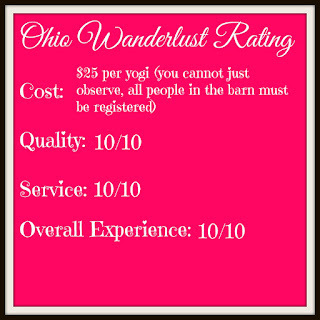 Goat Yoga classes are hosted by Threads of Wellness, a Lorain yoga studio, but the classes are held at Downs on the Farm, a non-profit founded to give people with developmental disabilities a place to participate in Animal Assisted Activities. The mission of Downs on the Farm is "to bless and enrich the lives of special needs kids and adults that reach out to us, make homes for as many neglected animals possible, as well as educate others of the importance of responsible agriculture and natural growing techniques." Goats are playful, generally friendly critters that love to see what you are doing...from on your mat, to under you to even on top of you! These loving animals will explore yoga and demonstrate some of the most sought after qualities we wish to instill in ourselves: non-judging, loving, happy, curious, playful and restful. Downs on the Farm is not far off the turnpike, and there isn't too much on the road that it's located on. I did pass it the first time, but knew immediately that I had done so and was able to turn around and get back to the start. Look for a farm with a parking lot near the road. As we walked to the entrance, I took off my earrings, and Julia and I already had our hair up. Goats like to try to eat EVERYTHING. Once you sign-in and sign a waiver (standard for any and all yoga classes), you have about 10 minutes to snuggle with the goats. There were two tiny baby goats and the other five (or six) were still little, but much larger than the younger ones. In the photos below, you'll see us holding the babies, whereas the older goats just kind of roamed. When we got there the babies were being snuggled and all of the other goats had found a comfy location to sit on someone's blanket. There's a mix of blankets and towels throughout, yoga mats are hidden beneath, because the goats like to eat the mats. The goats are surprisingly smart though, you can see Oreo in the photo below trying to lift Julia's blanket to eat the yoga mat beneath. The class is deigned to be a gentle flow, although instructor Tanna Torkelson will give you the option to choose your own flow and to make the practice your own. If you're not totally distracted by the goats, you can make this class as difficult as you would like as far as yoga moves. Whenever one of the little baby goats walks near you, you just have to snuggle it. Near the end of class the goats were re-energized by treats! You MUST bring a towel or blanket with you to cover your mat, it is a requirement. The mats will be provided to you, because every once in a while a goat will manage to distract someone and take a bite out of a yoga mat. The goats will step on you, attempt to eat your clothing, and hair. They're little and cute, and the reason you came to Yoga with Goats was probably to interact with them, so just don't wear your best clothes. This one seems obvious to me, but just in case -- the goats will make a mess. There were people at the ready in case a goat decided to pee on the floor or poop on your blanket (the latter happened to us). Our class managed to avoid the goats peeing on people, mats, or blankets -- but it probably happens. It's the risk you take with any animal. This is not going to be an intense vinyasa flow, we spent most of our time playing with the goats. Most people spent the majority of their time playing with the goats, they will make sure that they are on top of you or directly in the way of your yoga pose. It's fun! The goats are interested in interacting with you and with each other. At one point the babies had a very cute little scene together in the middle of the room, because they were being held by different people and missed each other. The entire point of this session is for the novelty and relief of stress and with this class, you will get it.